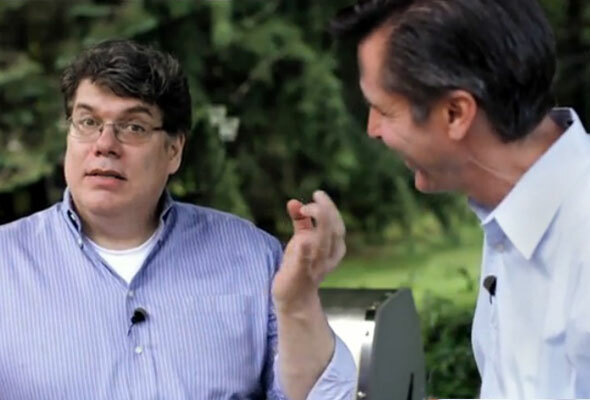 The third and final installment of the great afternoon of grilling with Jamie Purviance triptych was the one I was looking forward to the least. Not because I was tired of Jamie. (But, boy, was I tired—just look at what 10 hours of shooting can do to a guy’s hair and the bags under his eyes.) No, I was dreading it because the subject matter is the bane of almost every skilled griller I know: fish. Historically, whenever I grilled fish, most of it ended up dropping through the grates and getting incinerated—each piece slowly shriveling up as it turned a blacker shade of charred. After these marine Joan of Arc moments grew too numerous—I mean how many patio autos-da-fé must a man witness before he gets the hint as to his lack of affinity to fire and fish?—I simply walked away from anything aquatic. I figured if I were to singe anything, at least let it be something solid that I could chase around the grill with a pair of tongs, like grilled steak or fire-rostissere chicken. But during our last video of the day, Jamie taught me three important things. (Well, he taught me plenty of important things, but if you remember just these three, you’ll be able to stand facing your grill with a grate full of fish and not quiver. Too much.) First, use high heat. Second, the 70/30 rule. And third, the Zen of fish cookery–that’s me trying in vain to practice it in the photo above. What blew me away was that high heat—upward of 500 degrees—is the right temp, especially for salmon. It sears the fish, helps it hold together better, and creates great grill marks that result in it releasing easier. Lower heat, which I always thought was best for such a delicate protein, actually causes the flesh to stick worse than your aunt’s thighs on plastic car seat covers. And sticking flesh is what causes you to lose your mind when you try to flip your fillets. The 70/30 rule is something chefs use. It means to cook the fish for 70 percent of the time on the first side—the flesh side—and then to flip and cook the skin side for 30 percent of the time. Again, this reduces stickiness and keeps the fish juicy. Oh, and it lets you pull off what is without a doubt the coolest grill trick of the season: removing the fillet whole while leaving the skin on the grill. Boo-yah! This is the hardest of the three major points for me to put into practice. It’s all about becoming one with the fish and having patience—that sort of thing. (Hell, I have a hard enough time becoming one with myself, let alone joining forces with my meal.) But rushing things on the grill, especially something as delicate as fish, will only end up with the dog (yours or a neighbor’s) surreptitiously slinking away with your dinner that you chucked across the yard out of utter frustration. Need to practice the practice of Zen cookery? I do, I must admit. Until I’m able to roll that beautiful piece of salmon as suavely as Jamie does in the video, I’m turning to these recipes—Grilled Red Snapper Tacos, Grilled Littleneck Clams, and Portuguese Grilled Shrimp with Hot Sauce—kind of like recipes with training wheels. Most of my friends here in the Pacific Northwest do not turn salmon fillets. Yes, you start with high heat to sear the skin (skin side down on the grill), and then sometimes turn down the heat a little to bake the fish with the lid closed, depending on the thickness of the piece. And you take the fish off the grill just shy of being actually done, as it will continue to cook on the way to the table. That’s a wonderful technique. Thanks for sharing it. It should appeal especially to people who like the skin to be crispy. If your fillets are thicker than about 1 inch, I recommend using the “Pacific Northwest technique” over indirect high heat. That way, you avoid the risk of the skin burning. If the skin ever does burn, it’s good to know you can scoop the salmon off the skin like I show in the video. Thank you both so much. I learned more about grilling a piece of salmon from this article and video than all my previous reading and attempts combined. It doesn’t look difficult, and it makes sense. I think I’ve tried to make it harder than it was, all this time. I love the idea of taking it off the grill by separating it from the skin. Do you recall the total cook time for that size, and were they about 6 ounces? Thanks again, it’s next on my grill and next in line after that is a chicken brined by The One’s recipe. Susan, thank you for the kind words. They mean a lot, because our goal was to have a lot of fun and to teach grilling fundamentals. And if that meant I had to be the goofy sidekick to Jamie’s professor, I was fine with that. I’ll do just about anything to make sure my readers get what they need. Yes, Susan, the fillets were about 6 ounces and 1 inch thick. The total cook time is 9 to 10 minutes, meaning about 7 minutes on the first side and 2 to 3 minutes on the second side. I hope you enjoy your salmon. I have grilled fish with great success. I think the main thing is to cook over high heat. I cook for about 6 minutes on one side and 3-4 on the other and I make sure to stay by grill watching. I know the moment to take it off the grill. If I walk away for even a minute, the skin becomes toast! WF had a wild Alaskan salmon sale last week and that nailed it for me. I just own one of those skillets with “speed bumps,” and used the same technique—enough oil, very high heat and 5 minutes of cooking on one side and 2 on the other. It got amazingly crispy on that first side and sooooo good. That skin off trick, though, is a classic! One my favorite results of this technique is that you get the slightly crispy texture from the seared surface of salmon mixed with the smooth, slippery interior. The combo makes for some seriously good eating. Thank you so much to of you. I tried to cook it yesterday, thanks to your blog too I learn so much and it success. I posted the picture of my salmon grill on my Facebook. My friends love it and want to try it too. So I posted your link on the bottom of the picture so they can see it by themselves, hope you dont mind. Once again.THANK YOU. Thank you so much to both of you. I mean it.